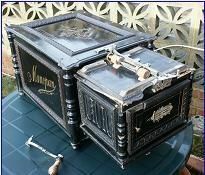 In September 2003 I saw a Manopan advertised for sale in Austria and a translation of the advert showed that it was complete but in need of restoration. Two bands of music were included with it. I obtained photographs and dimensions of the instrument which I checked with the recently published 'Organette Book' by Kevin McElhone. This indicated that it was a 39 key twin reeded model so I decided to buy it. 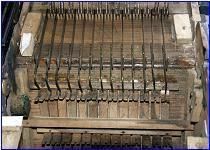 The Manopan organette was made in Germany and was available in three different key sizes - 16, 24 and 39. Each key size had different options available - single or double reeded, drums etc.. Music was made in endless bands of different lengths or in normal book form. The organette consists of two boxes joined together. The larger box contains the feeders, reservoir and drive mechanism and the smaller box the key frame and reed blocks. On the twin reeded model the top 36 notes are tuned celeste whilst the three bottom bass notes have octave helpers. Whilst waiting for delivery I spoke with Brian Chapman about the instrument and he was eager to see it when it arrived. He also offered to undertake the restoration with my inexpert help. When the organette arrived I unpacked it and took a series of photographs. Whilst taking these a date of Feb. 1888 was found stamped on the bottom board. Also, embossed in the bottom frame the number 18 appears twice and the letters AE once. Written in pencil on the bottom are a number of words/initials. On the side of the key frame box is a nickel plated brass plate of Joseph Leopold Pick, a musical instrument retailer from Vienna. Some instruments were later stencilled as 'Pick's Manopan' on the front. When we started to dismantle the organette it was obvious that previous attempts had been made to keep it playing. We found PVA glue, double sided foam tape and a substance similar to Gum-Gum had all been used to stop air leaks. The key frame had also been crudely altered. The reeds, however, were all there and although dirty looked in good condition. The rubber drive rollers were also in poor condition (this had been mentioned in the advert.) and had to be replaced. Inside the instrument we found that the feeders had been painted green, again in an attempt to keep them air tight. There was no sign of woodworm anywhere in the instrument. The instrument has now been completely restored after much hard work by Brian. The restoration was made particularly difficult because of the previous crude attempts to keep it playing. In particular the adjustment key frame caused many problems. I think that at times my name and the word Manopan were not mentioned by Brian or his wife. At present I know of one 24 key and two 39 key (single reeded) Manopans in this country in addition to mine. For the 39 key instruments we have between us over twenty titles but most of it needs to be re-cut. Luckily I managed to buy six books of re-cut music from Germany but this supplier has now retired. From the serial numbers seen on the music over 1500 titles were made for this instrument. I am creating a database of the known titles together with the serial numbers and if any members have any details I would be delighted to hear from you. My sincere thanks go to Brian for all his hard work and dedication in restoring this unusual instrument for me.